For any new people who have bought a "LS2 Upgrade" like myself and curious about dwell and maybe having issues with oltmans table, See Post 184. oltman's tables, i got a misfire around 4-6k rpm partial throttle etc. Teamrx8's table solved it for me, so it may be worth giving that one a go! That was the first thing i checked cause i do not trust my engine builder so when i replaced the plugs about 1k miles ago, i re-checked all connection. Similar issue with new plugs, and so i went to "Suffering from a mis-fire thread" And did all the steps there and thought maybe the compression is that bad lol. OR i have a defective coil. Someone at work also mentioned to make sure the OMP table doesn't have a spike because i did turn it up myself so i could have easily made a mistake (Which i did around 4k about mid load 4500 turned up slightly high so i smoothed that out) but also that if i messed around with dwell, to revisit this page and make sure my numbers were right, so i tried team rx8's which were similar to what i had but some portions were slightly off. Figured i'd try it and no misfire or any noticeable issues so far. about 300 miles. I could be wrong... but it appears Versatuner's dwell table is in microseconds, not the raw value that other software uses. So you would want to take the bottom table you have and multiply it by 100 and input that into Versatuner, not the upper table. Using the upper table would result in very small dwell that probably wouldn't even run at higher loads, if at all. This is a stock dwell table in versatuner. doesn't look any different than the one auzoom posted on the first post. also i used the settings that Team posted raced the car this past weekend and the car ran fine other than some misfire during part throttle, which i got before i even installed the d585 coils. got a new MAF sensor and it didnt misfire on street anymore, but was still getting misfire on track this past weekend. Last edited by trackjunkie; 10-15-2018 at 11:47 AM. Yep! I'm looking at the same thing. 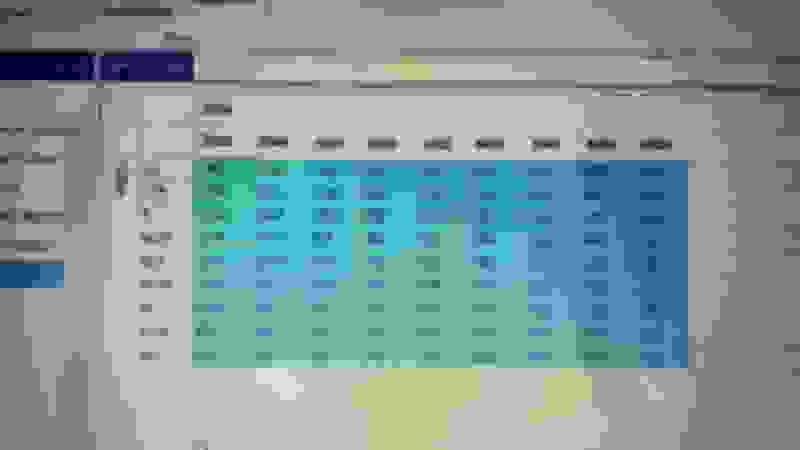 See how the top left value would be 18ish if divided by 100? And how in the previous table the resultant dwell would be ~20ms? 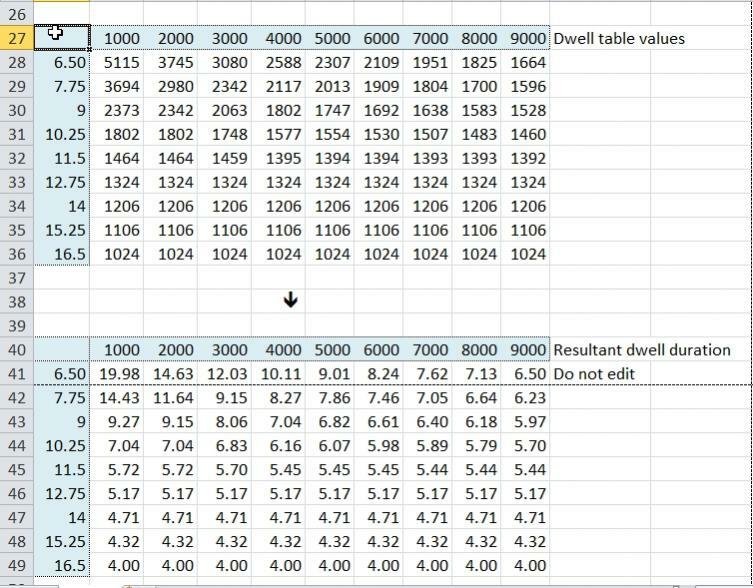 For the d585 it seems like we'd have to bump up the dwell by a little bit everywhere to take full advantage, so it seems like the 'resultant' table is the one thing should be based off of in Versatuner, just multiplied by 100 since the values are scaled weird. In previous flash tuning software it seems like the values in that table are 'raw' and don't have much real world value without scaling, but in Versatuner they have attempted(although not completely correctly) to scale them to ms for us. Yes , been using almost identical table on my turbo Renesis and every other one I've tuned ever since this came to light and ...............no issues. Caution with high residence times! The original Mazda coils carry a protection that prevents them from charging more than 8 ms (2048 in dwell numbers). 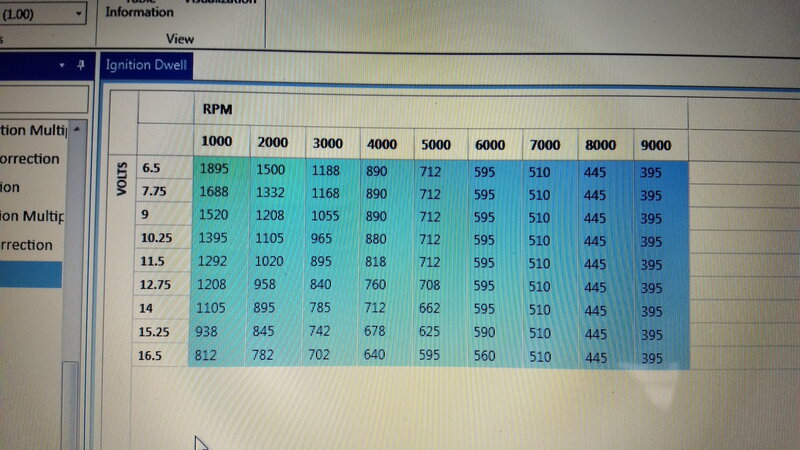 If these 8 ms are exceeded, the load is interrupted and the discharge is thrown on the spark plug. As in normal operation we never work in that range, the table does not cause problems, but if we use it as a reference and extend that misuse to other ranges of rpm / volts can give us problems. Apart from the risk of overloading the coils, I think that those long times have another problem: A dwell time of 21ms causes the PCM to start charging the coil 21ms before the ignition moment, but as at 8 ms the coil activate the protection, starting the discharge, we are making the ignition go forward 21 ms - 8 ms = 13 ms before the correct point and this is not good for the engine. I disagree, it was in this same thread where I saw the dwell map that I mentioned the first time and in the post it indicated that I had been using it for a few months.. Subsequently I have seen references to that same map in other forum posts and even in references to it from other forums (eg from the UK). The truth is that in the continuous crossing of messages, the reference is often lost on whether we are talking about stock coils, aftermarker, improved coils, etc. so that someone can mistakenly use a Dwell table of 585s, LS2, etc. in OEM coils. The only thing I wanted with my message is to warn of the risk and uselessness of raising the time above 8 ms in the stock coils. Last edited by manuRx8; 12-13-2018 at 02:16 AM.